John and I now live closer to both our families. 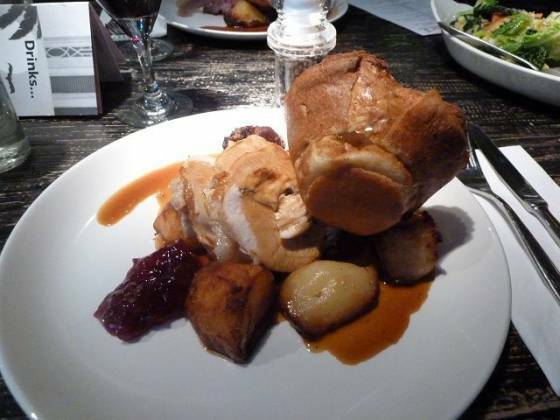 One of the many good points is that we can meet up with family for a Sunday roast, of course! This week we met up with John’s grandparents, and went to The George in Hayes, Bromley. I found The George online a number of weeks ago while researching pubs in our area. 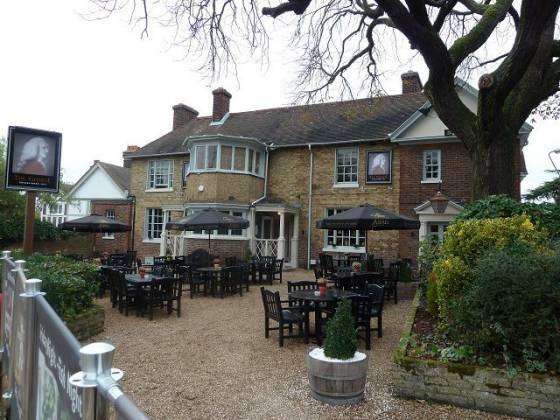 It has two sister venues; The White Horse in Bearsted (where we had our Christmas lunch last year) and The Plough Inn in Dartford. The menus on their website made my mouth water (Black Forest Tiramisu! ), and so I decided one of the three definitely must be visited for a roast soon. Arriving outside I felt slightly apprehensive as the pub didn’t look as impressive as I imagined, but walking in I was appeased. The inside was clean and contemporary with some nice quirky touches, like the cowhide chairs. We walked up to the bar and were greeted straight away, then were shown to our table in the restaurant area. Walking through, I noticed some of the flooring was also made of cowhide which kind of reminded me of a steak restaurant John and I have visited a number of times. The restaurant area felt a bit darker and more warmly decorated than the main area. It was quite empty when we first arrived although we were pretty early (arriving around 1pm). As time went on the area filled up, and though there was a party next to us the whole atmosphere was relaxed. Looking at the menu I was torn between the pork and the turkey. At this point the food arrived at the table next to us and my mind was made up – turkey for me! It looked really good and my mouth started to water. John ordered the lamb, Granny ordered the pork and also Granddad ordered pork. We didn’t order starters, but it should be noted that all starters (and desserts) on the Sunday lunch menu were priced at £3 each. Usually they would be priced around the £5 mark. The lady serving us was fantastic. She was helpful and cheerful, and made the experience a really good one. She was always there when we wanted to order without being intrusive. The plates arrived with the vegetables on a separate dish. My plate consisted of turkey, cranberry (or redcurrant) sauce, a small sausage wrapped in bacon, a small stuffing ball, a Yorkshire pudding and potatoes. We were all impressed with the vegetable dish as it was made up of a varied selection (roasted carrots and parsnips, with cabbage, leeks, sugarsnap peas and broccoli). All the vegetables were cooked how I like them (the greens being al dente). The only bad point about the vegetables was that there was only one dish between the four of us, meaning we needed to be a little modest with our portions (John’s grandparents wanted less vegetables than John and I so there was enough with all the other food on our plates, but I think if there were 4 people with large appetites the dish would be too small). The turkey was a good-sized portion for me, and I was delighted that it came with some extras. Unfortunately though the stuffing was over cooked (well, actually, it was burnt) but I still ate it, and the rest of the extras were lovely (John gave me subtle hints that he’d like my sausage with bacon – but you can’t blame me for not sharing it). The potatoes weren’t as crispy as I like but I enjoyed them and ate the lot. The gravy portion was far too small for me and it detracted from my meal slightly as I found my meal becoming increasingly too dry as my gravy was soaked up. We all then decided to order the desserts (now you can see why we didn’t order starters, we needed room for pudding!). I’m an indecisive person, and so once again found it hard to decide between the chocolate roulade and the lemon tart. After some serious deliberation I still hadn’t reached a decision, and so when the waitress came over I panicked and ordered the lemon tart. I immediately started wishing I had ordered the chocolate (I take this very seriously)! 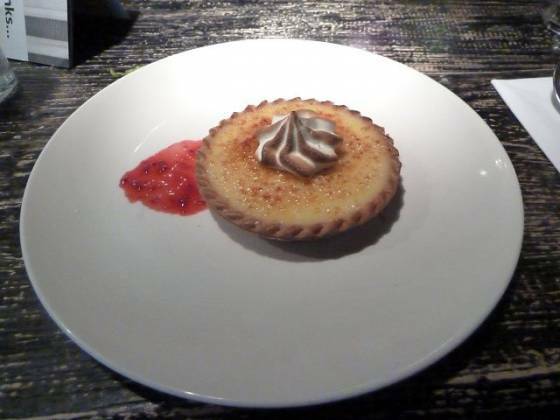 The lemon tart was presented well and was enjoyable, although it was served with a fruit coulis and I would have much preferred it with a little cream. I didn’t think it worked as well as it should. But it was delicious and once again I felt the need to loosen my buttons on my jeans (I didn’t though, as that would have been pretty embarrassing). I just wished the Blackforest Tiramisu had been on the ‘special’ dessert menu, but then it just means we’ll have to revisit so I can try it out! 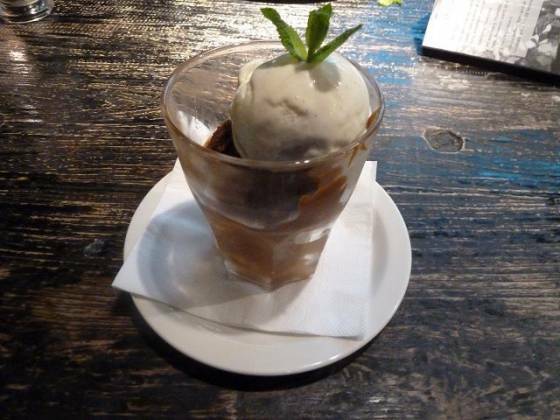 John ordered a sundae, and although he wasn’t too impressed with the presentation (it seemed to be in an ordinary glass rather than a sundae dish) he enjoyed it thoroughly. 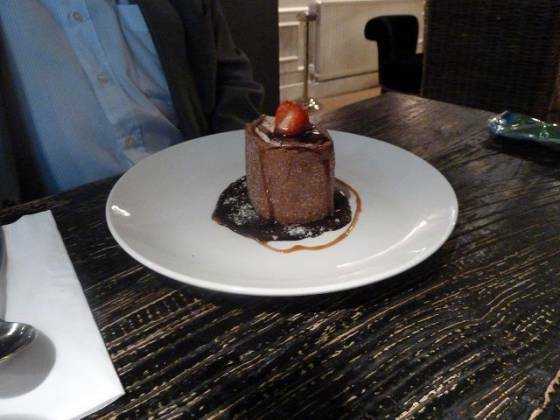 Granddad ordered the chocolate dessert I had my eye on, and I was even more envious when it arrived. Reaching a conclusion, the experience as a whole was a positive one. 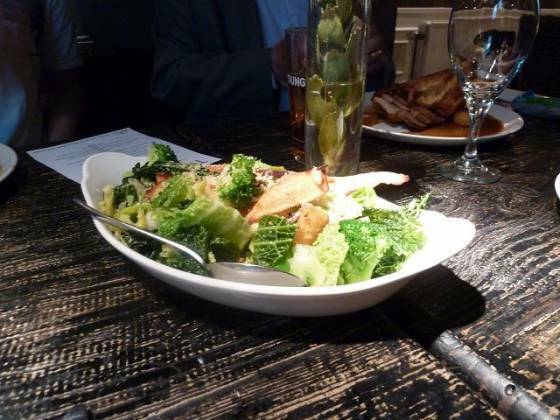 The food was enjoyable, the service warm but efficient, and the venue comfortable and inviting. The only real ways I think they can improve is to increase the amount of vegetables per table, crispier potatoes and offer an extra jug of gravy :-) The special price of £3 for starters and desserts on a Sunday is fantastic value. 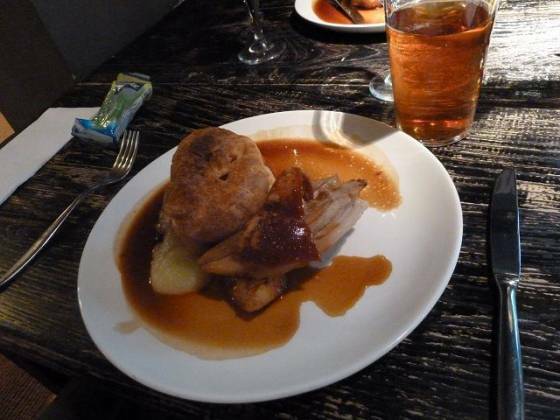 I am more than happy to recommend a Sunday roast here for an informal, inviting place to eat a relaxed meal. Scores a very high 4.5 plates out of 5.